You know when you pick up your baby right after a bath and you smell that sweet baby smell? It's that unforgettable scent that, though ever so slight, still invokes memories of your newborn several years later. Ever since I first purchased Mustela products at Moms to be and More nearly a decade ago, I decided to use them with both of my children during their baby years. 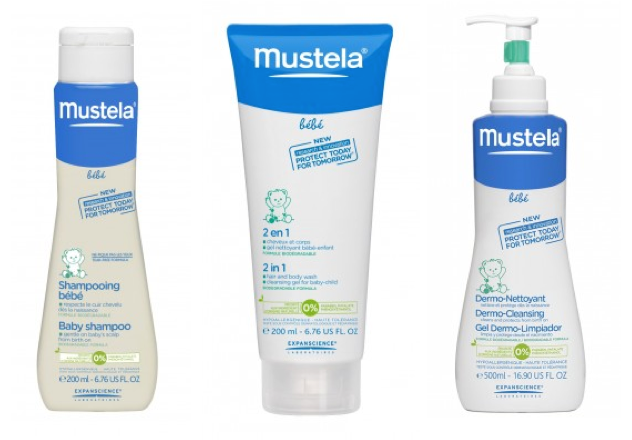 We relied on three main products: Mustela Baby Shampoo, Mustela Dermo-Cleansing and Mustela 2 in 1 Hair and Body Wash. The decision was based on the fact that their baby products are made using a tear-free formula, are hypoallergenic, paraben, phthalate and phenoxyethanol free and contain mostly ingredients of natural origin. Plus, they just smell oh, so good! Recently, I was sent some Mustela samples to try out and share with my two year old niece. One product which I had not previously tried was their Facial Cleansing Cloths. These cloths are listed on their site as a Best Seller and cost about $9 for a package of 25 cloths. While I like the idea of having them on hand in your diaper bag for those times when you are out and about with baby, I am not sure I like the lingering scent. I tried using a cloth on my own face and I have a feeling that it was the scent of Aloe vera leaf extract which is used to help soften, soothe and moisturize. What can I say? I just don't like the smell of Aloe vera. My niece, however, used a wipe during our Easter get-together and she was perfectly fine with it. The one new product that I am excited about is the Mustela Foam Shampoo for Newborns. My niece will soon have a baby brother to play with and having an ultra-gentle foam shampoo readily available in a pump bottle will be an added bonus for mom and dad. It is specially formulated for newborns to cleanse hair and scalp as well as prevent and treat cradle cap. The mild exfoliating action of BHA and salicylic acid help to soften and rinse away cradle cap flakes while gentle surfactants help to prevent their recurrence. It is also biodegradable and composed of 95% of ingredients of natural origin including Avocado Perseose, which reinforces the skin barrier and preserves the skin's cellular resources. I just found out they are now available at Shoppers Drugmart. I'll have to check out my local Shoppers Drug Mart for these!